The crucifixion of Umar Johnson? 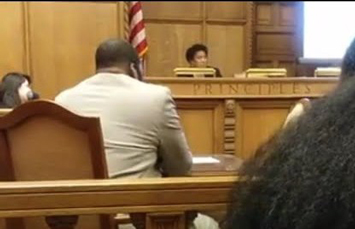 HARRISBURG, Penn.—It was a cold drab day pending an ice storm when Dr. Umar Johnson appeared before the Pennsylvania State Board of Psychology in a fight for his professional life. Facing hearing examiner Jenni Chavis, Dr. Johnson faced charges that he engaged in the practice of psychology without a license. If he is found guilty, the result could be a $10,000 fine and loss of professional privileges. Dr. Johnson did not come to the hearing room alone. It was packed with supporters, some 100 strong both inside and many outside could not gain entrance into the hearing room. Umar Johnson is a doctor of clinical psychology and certified school psychologist who works with the parents of Black children who receive special education and are diagnosed with disruptive behavior disorders. His African-centered view, sometimes volatile personality, and some clashes with others have created some controversy—and brought him a considerable number of admirers and detractors. However, none of these things were cited as the reason for the hearing that could strip him of his professional credentials and vocation. According to Dr. Johnson, he is currently at the end of a fundraising campaign to open a school for Black boys, the Frederick Douglass & Marcus Garvey Leadership Academy, and has raised over $400,000. It will be America’s first private K-12 academy for Black males based upon the principles of traditional African culture, Pan-African leadership, community self-determination and cooperative entrepreneurship, he said. Much of the proceeding and the charges appeared to hinge on word games as Dr. Johnson articulately defended himself before the hearing examiner. His defense was simple: He has always presented himself as a school psychologist; and he is allowed to practice school psychology privately as long as he is employed by a school. The state prosecuting counsel brought three pieces of evidence to prove his case: Two Breakfast Club radio interviews by Dr. Johnson and an old web site. In the radio interviews, Dr. Johnson, in short, said “yes” when the host referred to Dr. Johnson as a psychologist. He set the tone for the interview by explaining his credentials as a school psychologist. On the old web site, Dr. Johnson described himself as a “school psychologist” who offered psychological services. Dr. Johnson rebutted any allegation of wrongdoing by saying he is allowed to offer psychological services as long as he is employed by a school. Dr. Johnson went on to say that the added scrutiny started after the FBI released its controversial and disputed Black Identity Extremist memo. The 12-page report was issued last August, warning Black Identity Extremists were targeting law enforcement. The nebulous extremists were tied to philosophies that call for Blacks to have their own nation and believe in separation from Whites as opposed to integration as the FBI painted broad strokes that easily covered many Black nationalist and African-centered beliefs. There was never any proof the extremists had done anything and many, including former FBI personnel and Blacks lawmakers, rejected the existence of Black Identity Extremists. “My Go Fund Me page was suspended, as well as Facebook, Instagram won’t let me go live, Eventbrite won’t let me sell tickets because I’m too extreme. Now this,” said Dr. Johnson. Following the hearing, supporters gathered at a local art gallery. It was clear among those gathered that Dr. Johnson has provided valuable help to Black mothers fighting for a quality education for their children. 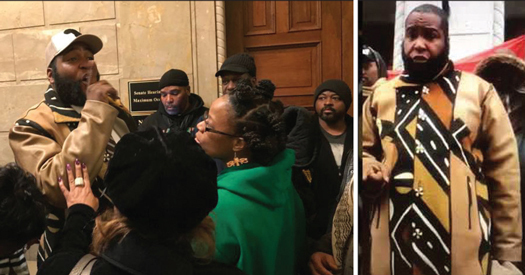 Kellia Swett of Montclair, N.J., told The Final Call, this is clearly a case against an unapologetic Black man who is committed to his people. “The testimony presented tried to say Dr. Johnson misrepresented himself when he has not. It reminded me of a high tech lynching,” she said. “A lot of people know about Dr. Johnson’s lectures but what they don’t know is how often he is in various schools across the country fighting for our children. There is a lot of gratitude for Dr. Johnson. In Montclair, N.J., because of the work Dr. Johnson has done we are about to have an anti-racism policy in our school, we have an assistant superintendent of equity, and all that came through unified parents influenced and trained by this man on the ground level,” added Ms. Swett. Despite his excellent work, Dr. Johnson has been called everything from a charlatan to a person suffering from Narcissistic Personality Disorder, said his defenders. Some headlines on the internet seemed to welcome his demise, “Controversial ‘Hotep’ Dr. Umar Johnson may lose his license, Black Twitter rejoices,” said thegrio.com. “Do The StANKHy Beg: Dr. Umar Johnson Might Lose His License, And Twitter Is Celebrating,” declared Bossip. “Umar Johnson Announces He’s Under Investigation for Hotep Hogwarts,” the Root.com declared. Dr. Johnson was undeterred, saying the current “witch hunt” had re-energized him. He was preparing for an Asian tour that will take him to Japan and China. When he returns, the noted school psychologist said he plans to make an announce on the location for the school in early February. “I need to up my timetable for acquiring the school. If what happened today is any indication of what they are capable of, I need to press forward immediately. The finalist schools are in Wilmington, Del., and Chicago, Ill,” he added.